Blue cranes are found in Africa. 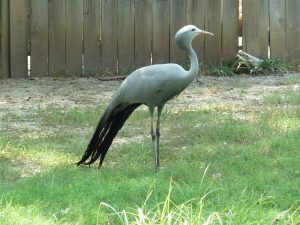 They are also known as the Stanley crane and paradise crane. Its population has been in a constant decline since 1980 and has been almost extirpated from Lesotho and Swaziland. Size: Blue cranes are 39-47 ft (100-120 cm) tall. Weight: They weigh around 7.9-13.7 lb (3.6-6.2 kg). Wingspan: Their wingspan measures between 71-79 in (180-200 cm). Color: This bird is pale blue in color with ochre to grayish bill that has a tinge of pink. They are found in Southern Africa, specifically the eastern and southern parts of South Africa. Small populations, which are declining still, live in Namibia, Swaziland, Zimbabwe, Lesotho, and Botswana. They inhabit dry grasslands at altitudes with little disturbance. During winter they descend to lower elevations. Depending on availability, they may breed in wetlands. 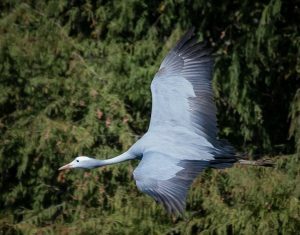 As mentioned above, blue cranes are migratory, although they only change altitudes with seasons. They are rather social, except for the breeding season. The hierarchy is usually led by the large adult male. They become extremely territorial during the nesting season, relentlessly attacking other animals like cattle, tortoises, and sparrows. They are omnivorous, feeding on insects, grasses, sedges, and small vertebrates. 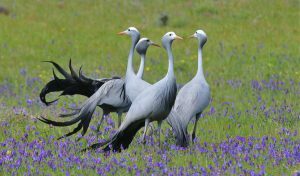 Blue cranes have their breeding season between October and March. 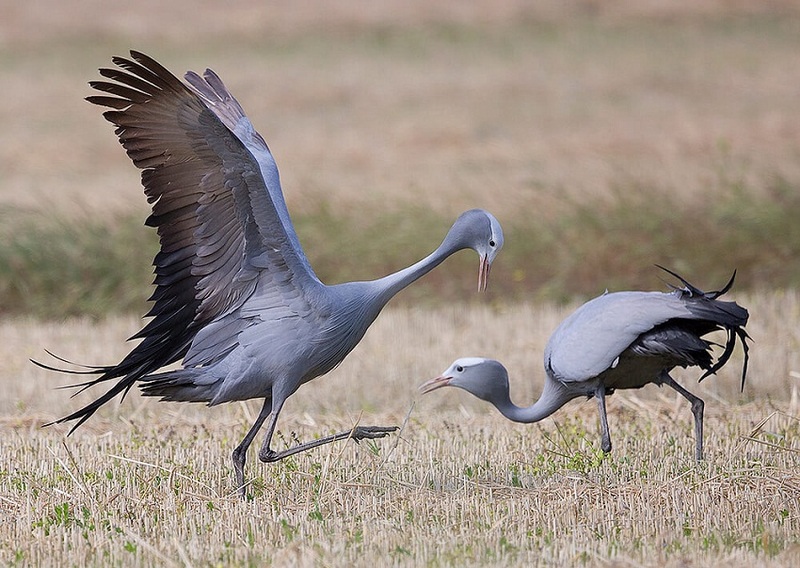 Males and females select each other in a ceremony that involves the male flinging objects into the air before a female chooses him over the other and joins him in the flinging and jumping. Breeding occurs in around two weeks. The female lays a clutch of 2 eggs which both parents incubate for around 30 days. Two days after hatching the offspring can start to walk on their own and swim soon afterward. They fledge after about 3-5 months of age. They are cared for until the next breeding season comes around, at which point the parents chase them off. They live for around 50 years. Blue cranes primarily communicate through sounds. They have a guttural sound like a bugle, which both genders use. Young birds make a soft peeping sound, which slowly changes into the adult bugle-like sound after they are 16 months old. 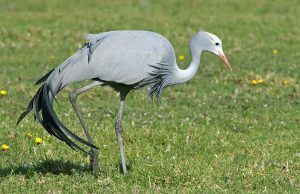 The short toes of this bird help them to run at high speeds. 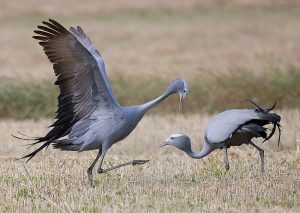 The bill of the blue crane is short, aiding it in gathering food from the grasslands it inhabits. Carnivorous wild animals like African wild dogs prey on this bird. 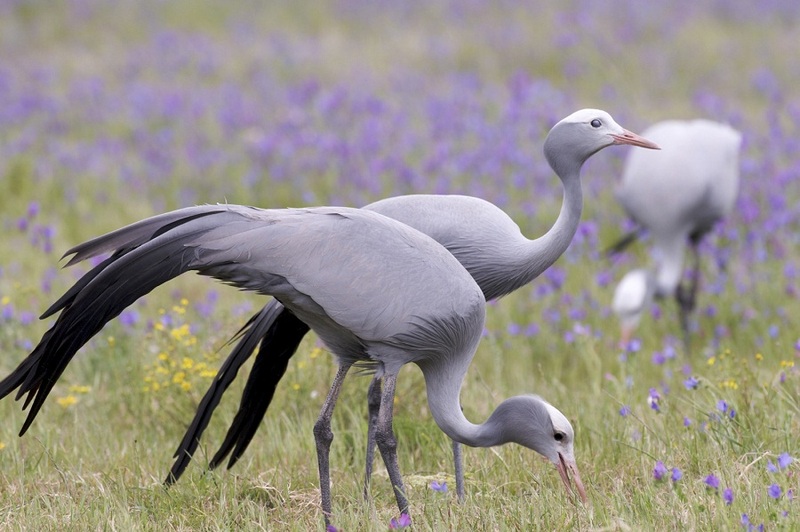 The blue crane is listed under IUCN’s ‘Vulnerable’ category. 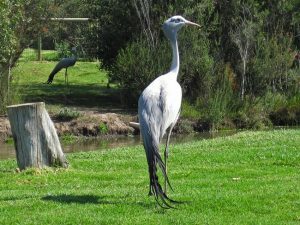 It is the national bird of South Africa. 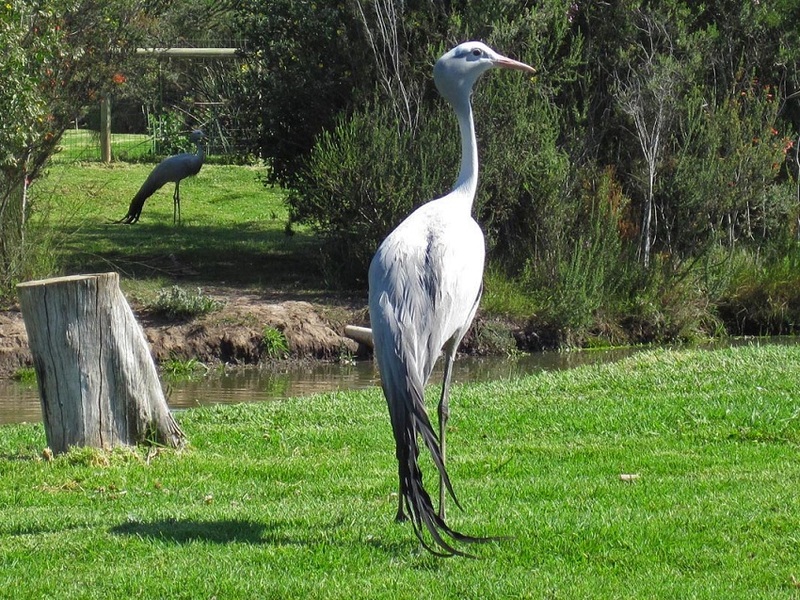 Warriors of the Xhosa people used to wear feathers of the blue crane into battle.